'Rick and Morty' co-creator Justin Roiland produced and voices characters on the show. Adult Swim’s new adult animated comedy Hot Streets looks and feels like Rick Sanchez from Rick and Morty gave the gang from Scooby Doo space drugs, and that’s for a good reason: Several members of the Rick and Morty team work on Hot Streets. So does that mean we might have Hot Streets to blame for any potential Rick and Morty Season 4 delays? Production on new seasons of Rick and Morty have gotten slower in recent years. We’ll probably have to wait until 2019 for more Rick and Morty, and with some of its creative team working on Hot Streets, it certainly doesn’t help. Former Rick and Morty writer Ryan Ridley said in January that nobody was actively working on Season 4 yet, despite an overwhelming demand for the show. One possible explanation is that Justin Roiland — who created Rick and Morty alongside Dan Harmon — has been busy on Hot Streets. And Dan Harmon juggles various projects, including a few podcasts and an upcoming Sirens of Titan adaptation. At least we’ve had this wacky new animated series on Adult Swim to hold us over. So what exactly is Hot Streets? “Hot Streets” refers to the name given to the FBI’s supernatural division in the show. Partners Mark Branski (J.D. Ryznar) and Donald French (Scott Chernoff) investigate all sorts of monsters and ghouls. Along for the ride are Branski’s tech guru niece, Jen Sanders (Chelsea Kane), and the sidekick dog Chubbie Webbers (Justin Roiland). Hot Streets’ showrunner and chief writer Brian Wysol first gained favor with Rick and Morty co-creator Justin Roiland in 2011. He has the same kind of insane, weird humor that Adult Swim is known for. Wysol actually wrote “Rixty Minutes” and other stories for Rick and Morty in the first two seasons, but left the show to develop his own stories. Enter Hot Streets, which is basically Scooby Doo on acid. Roiland executive produces Hot Streets and voices many of the side characters, including Chubbie Webbers, the bizarro Scooby Doo doppelganger that sounds like a Meeseeks or Mr. Poopybutthole with a floppy dog tongue. He’s hilarious on the show, but every time we hear the dog speak, we can’t help but wish Roiland was voicing Rick or Morty instead. With the fate of Rick and Morty Season 4 up in the air, there’s never been a better time to get into Hot Streets. The 10-episode first season of Hot Streets finished airing on Sunday, which hopefully means that Roiland can get right back to work on Rick and Morty sometime soon. 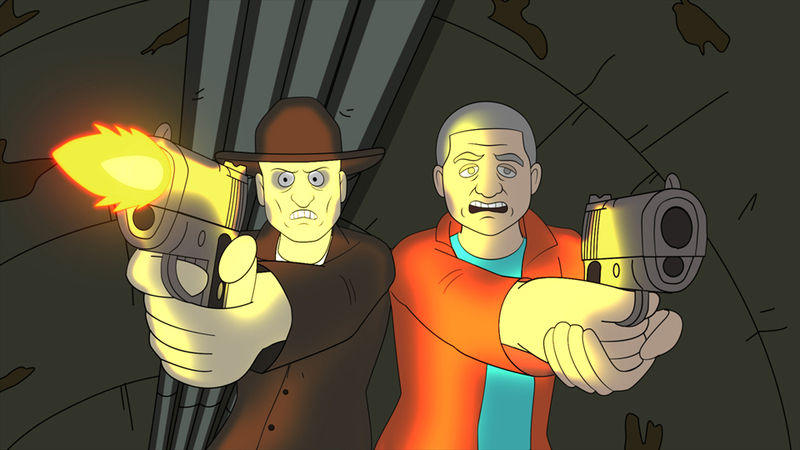 Hot Streets Season 1 is available to stream on Adult Swim’s website.